Where to Buy Desikote, Desikote Spray Adjuvant All Purpose for Crop - 2.5 Gal - $295.95 for Sale with Fast Free Shipping! Desikote Spray Adjuvant All Purpose for Crop - 2.5 Gal is a unique formulation of terpene polymer, a non-ionic wetting agent. Vessel 3 Way Herbicide Broadleaf Weed..
Desikote is a unique formulation of terpene polymer, a non-ionic wetting agent and is safe for use in tank mixture with agricultural and horticultural chemicals to improve their performance. Apply at 1.3 to 2.7 oz per acre in at least 21 gallons per acre of water. Where a high degree of rainfastness is required with approved formulations of glyphosate herbicide, DESIKOTE should be applied in tank mixture at a rate of 5.3 oz per acre in at least 21 gallon(s) of water per acre. Where the higher rate of DESIKOTE is used, the lowest label recommended rate of glyphosate herbicide may be used for weed control. On cereals (post harvest) the maximum permitted concentration of DESIKOTE is 0.2% of the spray mixture. DESIKOTE may be used at 6.7 oz/acre with up to 3.3 pt/acre of 360g/l glyphosate product or equivalent rates of other glyphosate formulations pre-harvest of cereals up to 7 days before harvest. The cereal crop should contain less than 30% grain moisture at the time of treatment. In addition to its use as a tank mix with chemicals, DESIKOTE may be used to prevent excessive transpiration. The soft, flexible film formed after the spray application dries, will significantly reduce moisture lost by the plant foliage. Plants are damaged frequently during growing seasons when cold weather fronts pass through crop areas. Damage occurs due to frost formation and freezing temperatures. 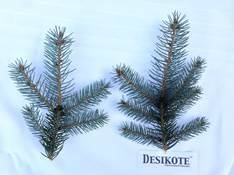 DESIKOTE will reduce the effects of frost, but will not prevent damage from freezing temperatures. To reduce the effects of frost, apply DESIKOTE at the rate of up to 70 ounces per acre per application in a full coverage spray, at least 24 hours before a cold front arrives, while there is still adequate sunlight to set the film. 70 oz. per treated acre in a high volume spray (50-100G per acre) with flat fan nozzles. Thorough coverage of the plants is very important. Desikote can provide protection for up to 2-3 degrees below freezing. Slows down the normal rapid herbicide uptake in the first few hours and spreads it out. Reduces transplant shock when trees, shrubs, turf grass and other plants are planted enhancing growth potential. Rainproof with all fungicides and other partner products. Only needs 30 minutes after the spray has dried, to prevent wash off by rain or irrigation. 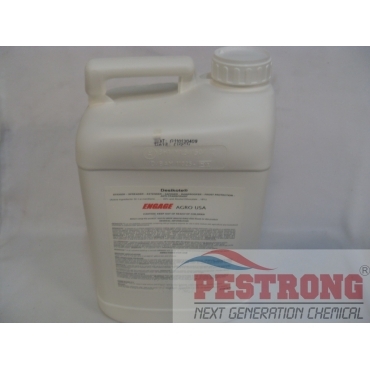 Extends the activity of all fungicides, and other partner products, including insecticides. Extends the interval between sprays. Provides frost protection in near-freezing weather conditions. Slows down the normal rapid herbicide uptake in the first few hours and spreads it out. Reduces transplant shock when trees, shrubs, turf grass and other plants are planted enhancing growth potential. Rainproof with all fungicides and other partner products. Only needs 30 minutes after the spray has dried, to prevent wash off by rain or irrigation. Extends the activity of all fungicides, and other partner products, including insecticides. Extends the interval between sprays. Provides frost protection in near-freezing weather conditions. 1. Wind Desiccation – When evergreens are exposed to dry cold winds, moisture is sucked from leaf tissue causing cell damage. Apply Desikote in Nov. or Dec.
2. Leaf Scorch/reflective damage – Occurs when sunlight is reflected from snow. Apply Desikote in Nov. or Dec.
3. Salt Damage – Road salt damages leaf tissue and roots. In the spring, hose down plants and drench soil to dilute salts. All purpose and best adjuvant for the crops , rainproof in about 30 minutes and protects the plant from frostburn, I said it before and I'll say it again, it is THE best adjuvant you can find in the market.